“Jesus never asked us to sit on the sidelines and cheer for his cause.” — Craig Groeschel, senior pastor of LifeChurch.tv Are you a fan or a follower? The dictionary defines a fan as “an enthusiastic admirer.” Fans want to be close enough to Jesus to get all the benefits, but not so close that it requires sacrifice. Fans may be fine with repeating a prayer, attending church on the weekend, and slapping a Jesus fish on their bumpers. But is that really the extent of the relationship Jesus wants? Jesus was never interested in having admirers. It’s not fans he is looking for. 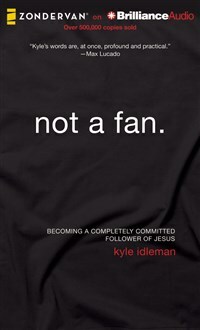 Not a Fan challenges you to consider what it really means to call yourself a Christian. With a direct frankness that you’re not likely to hear in Sunday school class, Kyle invites you to take an honest look at your relationship with Jesus. His call to follow may seem radical to us, but Jesus desires it for every believer. Kyle Idleman is Teaching Pastor at Southeast Christian Church in Louisville, Kentucky, the fourth largest church in America. He is the author of the award-winning and bestselling book not a fan. He is also the presenter of several video curricula, including not a fan, H2O, and the newly released study gods at war. - Kyle Idleman is Teaching Pastor at Southeast Christian Church in Louisville, Kentucky, the fourth largest church in America. He is the author of the award-winning and bestselling book not a fan. He is also the presenter of several video curricula, including not a fan, H2O, and the newly released study gods at war.